PetSmart has a responsibility to all its pets, even the fish. As my clever colleague SP Wood says, SeaWorld has Blackfish and now PetSmart has Goldfish. 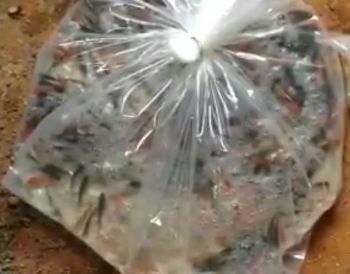 The pet care retailer PetSmart is apologizing after a video showing live fish being thrown out with the trash popped up on social media. The clip, filmed by a Michigan woman and posted to Facebook, has generated anger. PetSmart says an employee thought all the of fish were dead. And while some of the fish are, it’s clear that others are swimming around. PetSmart does a lot to promote pet adoption, finding them happy homes and giving them healthy lives. That message, and the images that come along with it, is easy when we’re talking about cats and dogs. A clip of a happy puppy with a new family is something people take time out of their lunch break to look at. Fish as pets are a bit trickier. You can’t cuddle with them. They don’t seem enthusiastic about your existence until you’re crushing a few food flakes in their bowl. Based on this spokesperson’s explanation, workers saw a tank of fish, many of them dead, and decided it wasn’t worth the time to separate the living from the group. But even if some people wouldn’t care, it’s part of PetSmart’s brand to treat each animal in its care like that cute puppy, to see value in the lives of all the prospective pets in their care. “A corporation whose business is selling to people who own, love and adore their pets (even fish!) do not need this! We shop at Petsmart. Rethinking that!!! !” wrote one Facebook commenter. That cuts right to the heart of the reputation issue this raises.